Nissan is in its final steps of preparation for the 2014 Le Mans 24 Hours, which runs June 14 and 15. This year Nissan is racing its innovative electric ZEOD RC car in the “Garage 56” category and has released some inside information about the car to the world. Nissan recently tweeted a stunning shot of the ZEOD RC, and it’s truly a sight to behold! Of course, race cars traveling at high speeds need to be able to keep their drivers safe, so they are crash-tested just like regular cars. Nissan released a slow motion video of the ZEOD RC’s crash test, and it’s quite remarkable to see all that carbon fiber in action. Check it out below! Nissan also released a blow-up view of the ZEOD RC to show us all the inner workings of the innovative race car. We’ll get another close look at the ZEOD RC racer on June 1, when the car will make its official debut in race trim at the Circuit de la Sarthe during the Le Mans Test Days. Here at James Ceranti Nissan, we can’t wait to see the Nissan ZEOD RC take the racing world by storm! The 2015 GT-R is one smoking hot car from the inside out, and there is absolutely no denying that. To top it all off, Nissan has added a little something special to its coat of paint. At a recent journalist event in California, Nissan showed off the Regal Red finish on the 2015 GT-R. You may notice how it sparkles in the sun… and the secret is real gold. Nissan added flecks of gold to the paint to make the Premium Paint option even more premium. In addition to high end paint so high end that it’s laced with real gold, Nissan added a few more touches to make each 2015 GT-R unique. Each 3.8-liter twin-turbocharged V-6 engine is hand-built and includes a plate listing the name of the engineer that built it. It also comes equipped with new LED headlights and offers a quieter interior ride than the previous model. However, even with the addition of all of these comfort features, the GT-R doesn’t lose any of its speed or performance capabilities. It will still launch you to 60 mph in 2.7 seconds. All of these premium features and speed will cost you, of course. The 2015 Nissan GT-R Premium comes in at $106,520. Start saving up, folks. Otherwise, admire the 2015 GT-R from afar, and come test drive a more affordable representation of Nissan luxury and performance right here at James Ceranti Nissan. Nissan has its fair share of thrilling vehicles with motorsport-inspired NISMO editions and the always fast and furious GT-R… Of course, some of the more commonly popular Nissans that share real life roads, like the Altima sedan, don’t inspire quite as much as excitement as their revved-up siblings. Don’t get me wrong, the Altima is one of our ultimate favorites, but it’s not exactly known for it’s racing capabilities. To change the way we think of the Altima forever, Nissan recently played an amazing trick on some willing participants in its campaign coined ‘Ride of Your Life’. They strapped everybody into what appeared to be a race-ready Nissan Altima, one that was specifically designed for the racetrack. Then the participants rode along with motorsport drivers, navigating thrilling laps around the track at top speeds. The video below is worth the watch for the passengers’ reactions alone. What happens at the end is the shocking part… watch now before you continue to read on! The real kicker takes place at the end of the video as the passengers watch the pit crew strip one of the Altima sedans of all its “racetrack-ready” exterior features – what remains is simply the Altima, and it’s simply awe-inspiring. Were you surprised, too? What’s so amazing about this is that Nissan used a standard 3.5 SL Altima with only a modified exhaust for the extra noise, and, of course visual changes like the spoiler and body moldings for the big trick. 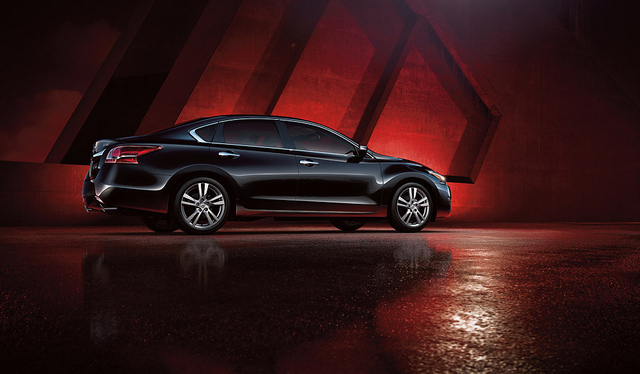 We have the 2014 Nissan Altima available now at James Ceranti Nissan. Come take it out for a spin and make your commute feel like the ‘Ride of Your Life’ each and every day! The goal was to not disturb the slumber of any of the French residents of Provence Alpes Côte d’Azur. Nissan set up a five kilometer course in the small village, and let the four LEAF vehicles race each other. Despite some toppled trash cans and an incident with a side mirror, Nissan reports everyone in town continued snoozing. And, of course, there was a film crew on hand so we can enjoy the “Silent Ride,” too. 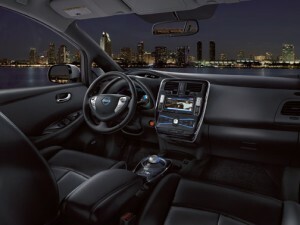 Add some peace and quiet to your daily commute with the zero-emissions Nissan LEAF! Give us a call at James Ceranti Nissan.